Departing Fieldcrest Principal Don Achelpohl has accused the Fieldcrest school board and Superintendent Michael Stagliano of covering up their actions in resolving the mold problem in some of the rooms at Fieldcrest High School. In an article published in The Pantagraph, Achelpohl stated that he alerted officials of mold at the school. He stated that three staff members are in the hospital for sinus surgery and that no notices were posted and no employees warned of the mold. Tests for mold were taken at the school and officials were given a warning that the school must get rid of conditions that cause the mold within 45 days, or August 1. Superintendent Michael was contacted to comment on Achelpohl's allegations. Stagliano stated that Achelpohl has suffered from a pre-existing condition not attributed to his duties at Fieldcrest High School. He went on to say that "claims that the high school building was the cause of illness among some staff and students is totally inaccurate and distorted." Stagliano said that the administration and the Board of Education has always placed safety and health issues of its employees and students at the top of their priority list. He said that documentation exists in the Unit office to back up these assertions and those who are experts in the field of Health, Life and Safety and indoor air quality and mold remediation, that the high school environment is not unhealthy. A full rebuttal by Superintendent Stagliano to Don Achelpohl's claims is printed in full in the email section. Click here for the rebuttal letter. Alderman Dean Barth told the city council that the fund drive for the Westside Park pavilion is nearing the end. Barth said that $21,000 has been collected so far but $13,000 more is still needed to come up with the $34,000 needed to start the project. He appealed to those who have not contributed to the pavilion fund drive to do so now so that the project can move into the construction phase. Barth asked Mayor Spencer if it is legal to grant construction contracts without bidding. Spencer replied that he thought it was legal. Barth said that the committee is meeting with the architect on the project to determine if the concrete work could be started for the structure. Barth said that the committee would like to do the project in stages that include concrete work, followed by block laying, followed by roof construction. Each phase would be separately contracted out. The council indicated that this would be a permissable approach to the project. Friday, July 5 at Capponi's in Toluca. The Master of Ceremonies for the evening was Jerald Hesselberth. Following the chicken/roast beef dinner, Jerald mentioned the items on the memorabilia table which included a lit candle in memory of the deceased classmates or spouses of classmates. Letters were read by the reunion committee from classmates that were unable to attend. Gary Cinnamon read an article about the death of Dan Dutko, he was killed in a bicycle accident in Colorado in July 1999. Don Stimpert announced that books have been purchased in memory of Dan at the Filger Library. Coming the farthest to attend the reunion was Gary and Karen Cinnamon from Sacramento, CA. A trophy was rescued from the old M-D-R High School and was given to Ken VonBehren for being on a team that won Midstate Conference. The sport is in question since the man on the top of the trophy was broken off. A trivia quiz created by Jerald Hesselberth was passed out and enjoyed by all. Gary Cinnamon knew the most answers and Ken VonBehren knew the least. The table decorations were won by Jerald Hesselberth, Sharon Tjaden Welch, and Jean Cremeens. It was decided to have another reunion in five years with Bonnie Stith Utz chairperson. Those in charge for this past reunion were Jerald Hesselberth, Jay Klein, Rodney Nauman, and Don Stimpert. A lot of pictures were taken and everyone had a good time reminiscing. Those attending were: Mr. and Mrs. Douglas Welch (Sharon Tjaden), Normal; Mr. and Mrs. Joe Stratton (Pam Bradbury), Morton; Mr. and Mrs. Don Cremeens, Metamora; Mr. and Mrs. Jay Klein, Minonk; Mr. and Mrs. John Mowery (Judy Seggerman), Avon; Mr. and Mrs. Norbert Soltwedel (Linda Tolan), Shumway; Mr. and Mrs. Jim Putman, Elgin; Mr. Howard Dunham, Streator; Mr. and Mrs. Gary Cinnamon, Sacramento, CA. ; Mr. and Mrs. Lowell Blackmore (Joan Ioerger), ElPaso; Mrs. Sharon Hume (Sharon Klendworth), Dumfries, VA.; Mr. and Mrs. Rodney Nauman, Metamora; Mr. and Mrs. Robert Gallick (Gayle Lee), Byron; Mr. and Mrs. Jerald Hesselberth, Morton; Mr. Ken VonBehren, Minonk; and Mr. and Mrs. Don Stimpert, Dana. For a group picture of the attendees at the reunion, , click here. A few thousand people crowded into Minonk Thursday night to watch the annual 4th of July fireworks. It was difficult to find a parking space as cars were lined along North Chestnut Street and even parked a mile away to the west to get a good view of the fireworks. After a hot, humid day, the night air became cool and provided a pleasant setting for the many people who sat on blankets or lawn chairs in Sutton's Park to watch the display. The display was accompanied by patriotic music with the song "Proud to be an American" finishing at the same time as the grand finale for the fireworks. This was followed by the American flag fireworks. In the aftermath of September 11, the patriotic display touched the emotions of the spectators. All in all, it was a great slice of Americana that reminds us how fortunate we are to be living in this great country. The parade was held in the morning and attracted many spectators as well. This year's Grand Marshalls of the Fourth of July parade were Tom and PJ Ketchmark. Tom is a former alderman and life-long resident of Minonk who has been actively involved in community affairs. 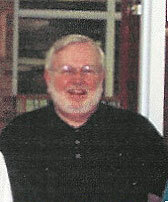 PJ was a dedicated teacher at the Minonk Grade School for many years. Saturday afternoon and evening a car show was held downtown on Chestnut Street. Chestnut Street was closed between 4th and 6th streets so that people could walk in the street to observe the cars on display. A community christian concert was held Sunday, July 7, at 7:00 p.m. at the Westside City Park. Music was performed by 2 X 2 For Him, a men's quartet. Over 120 people gathered to watch the group sing southern gospel music. The girls 10-12 South Bi-County all star team lost 7-6 in a game played July 3 at Hennepin. Even though the girls lost, they fought hard and had a good time. To see a picture of the girls team, click here. Former Minonk residents Jack Pierce and his wife Gerry were named grand marshals of the Peotone Country Festival parade on June 29. The honor is an acknowlegement of their contributions to the community. The Pierces left Minonk in 1964 where he had been a coach, elementary principal and high school principal from l950 to l964. Jack became superintendent of the Peotone School District in 1967, a position he held until 1987. 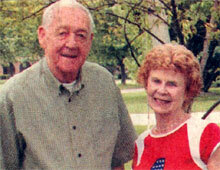 The Pierces have been very active in the Peotone community affairs for the past 35 years. He was a Peotone Village Trustee from 1987-1989 and has been Peotone Township supervisor since 1987. He helped create the Peotone Fire Protection District and the Peotone Library, and has served on both boards. He is an advisor to the Northeastern Illinois Area Agencyon Aging and serves on the board of directors for Will County. Jack served in the navy in World War II and has served as commander of the Peotone American Legion and remains an active Legion member. He attended the University of Illinois where he played in the 1947 Rose Bowl as a halfback on the Fighting Illini. He was the coach of the 1951 Minonk-Dana basketball team that went to the Sectionals that year. Gerry has been a Peotone Park District commissioner since 1997 and serves as secretary of the commission. She is also vice-president for the Historical Society of Greater Peotone. She has been the superintendent of fine arts for the Will County Fair Association for over 30 years and has won blue ribbons for her own paintings in many area art shows. Jack and Gerry are also volunteers at St. Mary's Hospital in Kankakee. They have been married for 50 years and have three daughters and nine grandchildren. Former Woodford County Sheriff Bill Meyers pleaded guilty to federal charges of mail fraud and money laundering Thursday, July 11. He admitted stealing more than $200,000. He resigned last year after an investigation found that he had misused county credit cards and federal grant money. Meyers faces a maximum penalty of 15 years in prison and a $500,000 fine. He is scheduled to be sentenced on October 25. Meyers has confessed to a gambling addiction and has promised to repay his debts as part of the plea bargain. The amount of restitution, if any, will be determined by the judge at sentencing. Richard and Peggy Voitik have purchased and renovated the building at 551 North Chestnut in Minonk on the site of the former Brackney Drugs. This building will hold two businesses. Just Stuff Antique Mall will be opening on 8/15/02 and is offering consumers quality craft and antiques. Booths are still available for rent. Space is available from cases to floor space and they will accept consignments. In addition, opening in the fall will be R&P Collectibles, which is a dealer for Budweiser, Harley Davidson, Doll House and Miniatures, Longenberger Baskets and many others. Richard and Peggy Voitik would like to take this opportunity to invite the public to stroll through The Just Stuff Antique Mall and RP Collectibles when they open. Former Minonk resident Tom Guinnee retired from teaching in the Watseka school system after 35 years of service to the school and 37 years in education. Guinnee is a 1959 graduate of MDR High School and a graduate of Illinois State University. After first teaching at Tremont, he came to Watseka in 1967 where he met his wife Lynda, who was a kindergarten teacher. They were married in 1969. He taught social studies at the junior high and high school levels and also coached track from 1967-2000 and football from 1967-1982. He currently teaches at Kankakee Community College two days in the summer and will teach two days in the fall and winter and spring, but in Watseka as extension classes for KCC. Tom and his wife Lynda have two daughters. Amy Jo lives in Canyon County, CA, and is a graphic artist. Carissa teaches second grade in Hillside and lives in Lombard. Tom said that his career has been rewarding and that he enjoyed working and living in Watseka. He said, "It is a great place to raise a family." Minonk native Joan Osterman received recognition in a Time Magazine article for her achievements in the airline industry. 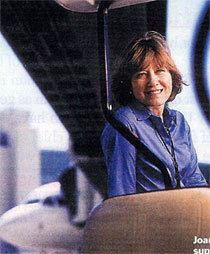 Osterman was mentioned as one of the few woman in the country who have risen to a top executive position in the male dominated airline industry. She joined Frontier Airlines in Denver four years ago. She negotiates leases, strikes deals with contractors and supervises all the airline's construction projects, including the airline's new headquarters building completed last year. Osterman, who is the daughter of Mrs. Marie Oltman of Minonk and a graduate of MDR, said she was always fascinated about how things are put together. In the article in the July Time Magazine supplement she said that "some of her most interesting work experiences come from sitting around the negotiating table and watching the jockeying that goes on between large airlines and smaller competitors for everything from airport space to baggage-system access." The article mentioned that a colleague jokingly refered to Osterman as the Black Widow for her stealthy effectiveness. She said that she tries to read her counterparts' body language and mood. "I'm not sure if that's a female way of doing things - it's just mine", she says. "I'm just working out how to get what I want." An open house was held Friday afternoon, July 26, at the Heritage Manor Nursing Home to celebrate the 105th birthday of Lena Folkerts who is a resident there. Mrs. Folkerts was joined by her children Virgil and Eldon Folkerts, Marie Oltman, all of Minonk, and Ronald Folkerts of Washington. A daughter, Lorene Johnson, is deceased. Mrs. Folkerts, dressed in a pale blue dress adorned with a corsage of white rose buds and baby's breath, seemed a little overwhelmed with the occasion. She said, "I feel like crying." When this reporter introduced himself to Mrs. Folkerts, she said. "So you're David Uphoff. Your father and I were second cousins." Her mental alertness and physical agility was remarkable. She was able to walk to the party room by herself with the aid of a walker. Cake and ice-cream along with punch was served to over 150 guests who dropped in to wish her a happy birthday. Pictures from different periods in her life were on display for the guests. Click here for a pictorial review of Mrs. Folkerts life.